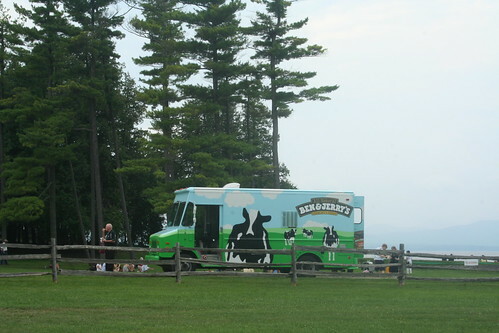 The 2nd annual Vermont Cheesemakers Festival takes place Sunday, July 25, back at the gorgeous lakeside grounds of Shelburne Farms near Burlington. 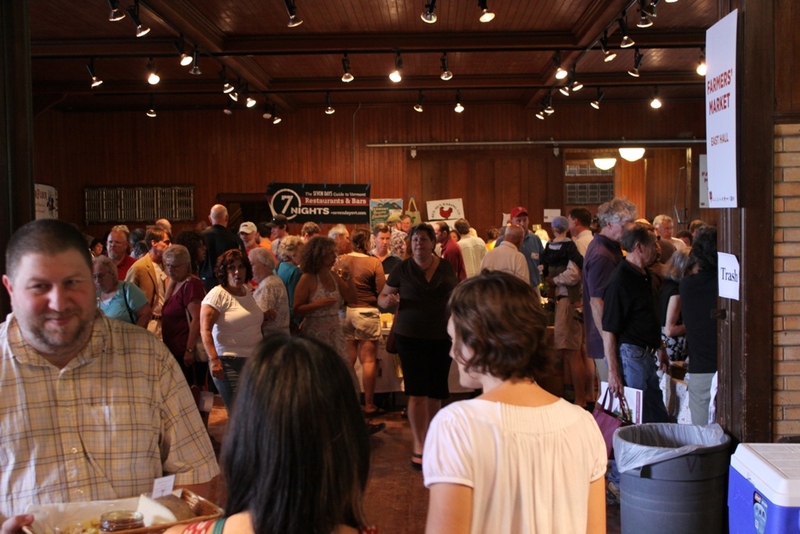 (Read our recap of last year’s festival for a preview of the deliciousness involved.) Tickets sold out in advance last year, and are well on the way to doing so again, so order yours today if you plan to go. The Vermont Cheese Council has a handy map you can consult to plan your own tour of Vermont’s 40+ dairy farms and cheesemakers over the weekend. Or, if you’re coming from New York or Boston, you can join a bus trip to travel in style. Formaggio Kitchen will conduct a day-trip from Boston, serving breakfast on the bus and hosting a private barbecue with their own grillmaster at Shelburne following the conclusion of the festival. And if you’re looking for a more budget-conscious way to enjoy the festival, it’s not too late to sign up as a volunteer. Contact Hilary at VBC — HSchwoegler@vermontcreamery.com — for info or to sign up. So tell us, have you bought your tickets yet? And if so, please report back — we’ll both be homebound with newborns and missing out on this year’s festivities. Last week, the Martha Stewart show aired an episode focused entirely on cheese — cheese from Vermont, to be precise. Emeril has been to Vermont recently as well. We’re tickled to see the celebrities discover what we discovered ages ago (you know, way back in August) … namely, that Vermont makes some damn good cheese. So much so that I wore myself out recapping my Vermont road trip and never got around to posting the final installment of my travelogue, our visit to Fat Toad Farm in Brookfield. 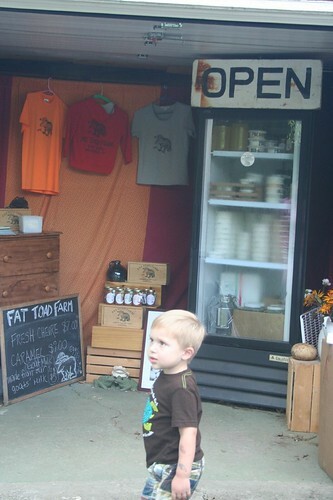 I discovered Fat Toad at the Vermont Cheesemakers Festival; their rich and creamy goats-milk caramel sauces, made in the tradition of Mexican cajeta, provided one of the sweeter complements to the many samples of cheese on display. Their fresh chevre was refreshingly pure and tangy. 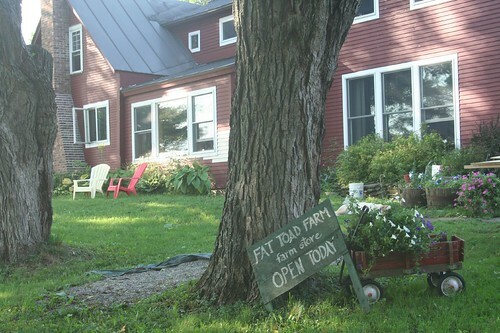 As I chatted with Fat Toad’s Josey Hastings, she mentioned that they were located not far off of I-89, our planned route back south to New York. Because of our rush to get to the festival on Sunday (after driving from Virginia to Albany, via Queens, on Saturday) we hadn’t built in much time to visit any farms but hoped to at least stop by one before leaving the state. 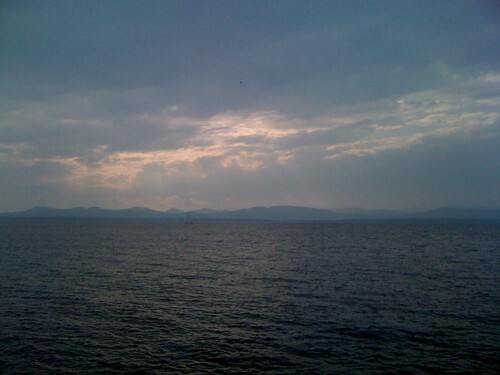 The next day, we decided to spend some time enjoying Lake Champlain and got a later start back on the road than anticipated. I called the farm and was cautioned that they were beginning evening chores, but would try to give us a quick tour. As we navigated the country roads to the farm, we passed rolling hillside meadows full of dairy cows, including those of Neighborly Farms. It was the sunniest day yet of our road trip and a perfect day to take in the Vermont countryside. When we arrived, Josey had extracted herself from putting up zucchini and graciously gave us the full tour. The quaint farm didn’t take long to navigate, as they are a small, family-run operation with about 40 Alpine and Saanen dairy goats. It was milking time, so we missed out on seeing the goats frolicking in the meadows but got to visit with them as they awaited their turn in the milking chamber. Josey and her family produce most of their own food on their property, including a few pigs (who are fed excess whey, naturally) and fresh produce. The maple for their maple chevre comes from a neighbor. 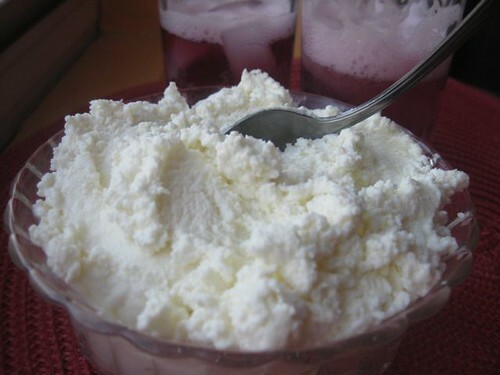 They’ve been making cheese commercially for only about two years, and have clearly developed a winning formula for high quality fresh chevre. 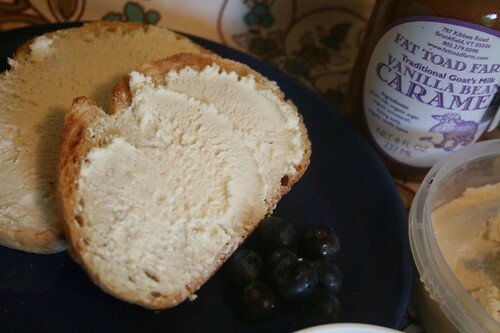 The mild cheese can be used as a dip or spread (try on bagels in place of cream cheese), or in recipes like their Fat Toaders’ Caramel Goat Cheese Swirl Brownies. Incidentally, my new secret to the best BLT sandwich you will ever have? A generous schmear of Fat Toad Farm maple chevre in place of mayonnaise. Pure bliss. Thank you to Josey and family for allowing us to poke around the farm. We hope to make it back again soon! 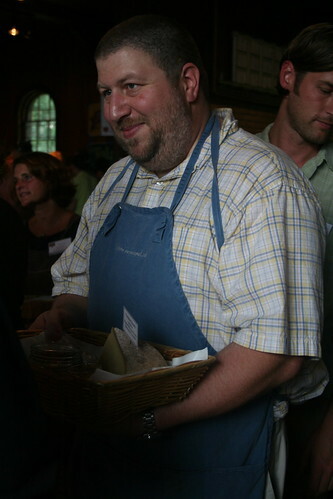 Save the Date: The 2010 Vermont Cheesemakers Festival will be held in July, Sunday the 25th, back at Shelburne Farms. The Cheese + Champagne Vermont Cheese Week Tour continues with another Vermont cheddar on the Wine Spectator list. Clothbound cheddars are common in the U.K., but a fairly new phenomenon here in the States. We’ve written before about the Cabot/Jasper Hill joint venture, and the Grafton Village clothbound is a team project as well. As we learned at the June Fancy Food Show, Grafton is now sending their wheels of clothbound cheddar to be aged in the sandstone caves of Faribault Dairy in Minnesota. Grafton clothbound begins with hormone-free raw milk from their Jersey cows, produced by their co-op of Vermont dairy farmers, and is aged up to 10 months to develop a smooth, creamy yet earthy flavor and the familiar crumbly texture of good cheddar. My taste buds were too taxed to try a Grafton/Cabot head-to-head taste off after making my rounds at the festival, but if you have the opportunity to try both at the same time I encourage you to do so and report back. And if you can’t find it at your local cheese shop, Grafton offers it for sale online. * editor’s note/musings: At the time of the Wine Spectator selection, Grafton’s clothbound was also aged at Jasper Hill. Since we were unable to taste it until now, we have no idea how the taste might have changed with the move to a new aging facility. 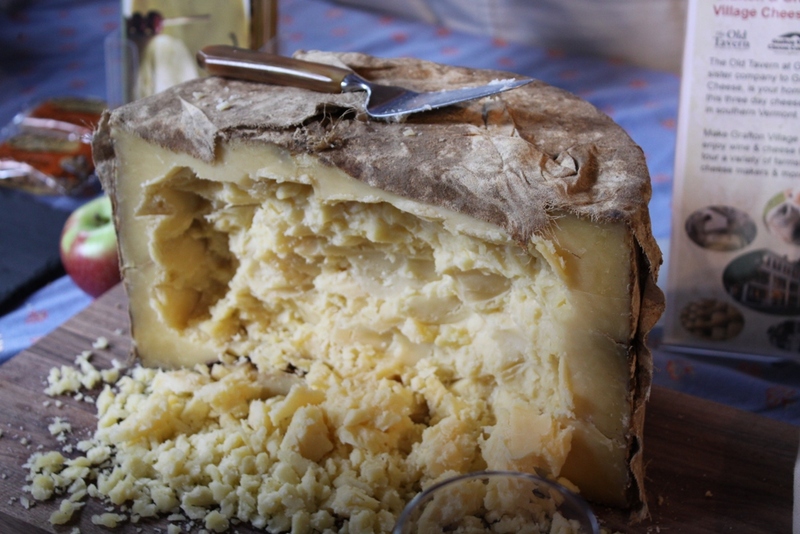 But wouldn’t that be a fun tasting experiment to taste identical cheeses aged in caves more than 1,000 miles apart? 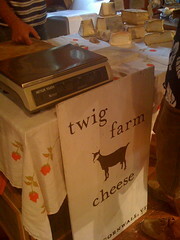 Vermont Cheese Week resumes here on Cheese + Champagne, now that yours truly has reluctantly returned back south. Stay tuned for more virtual postcards from Vermont and a taste of Brooklyn’s cheese world as well. 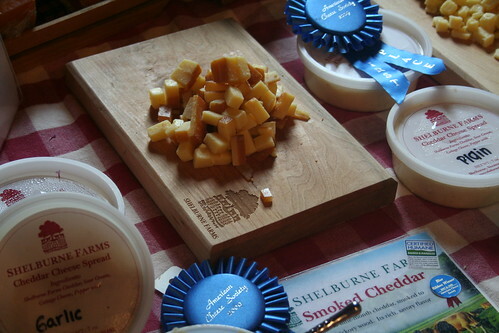 The vast estate of Shelburne Farms served as host of the Vermont Cheesemakers Festival, and perhaps my biggest regret of the weekend was not spending more time touring the 1,400-acre non-profit farm. 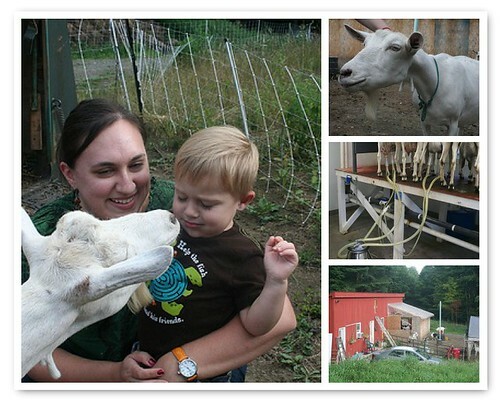 The farm is located just a few miles south of Burlington, and after driving up from Albany, NY, through the Champlain Valley we turned onto the dirt road into the farm expecting to see your usual grassy fields and dairy cows milling about. Sure enough, we were greeted by some meandering Brown Swiss cows, but we were surprised by the lush, FSC-certified forest, gorgeous 19th-century architecture, and most of all, to come around a bend and see this view of the lake. Stunning, even on the dreary grey afternoon. The farm was created as a model agricultural estate by William Seward and Lila Vanderbilt Webb (yes, those Vanderbilts) in 1886, and became a non-profit in 1972. The cheese is just one part of the farm’s environmentally and economically sustainable programs; the green-certified timber is sold to local furniture-makers, and they lease land that houses the vineyards and winery for Shelburne Vineyards, organically cultivating climate-appropriate grapes to make high quality Vermont wines. The herd of 200 purebred Brown Swiss dairy cows are grazed rotationally, meadows maintained without the use of chemical inputs and minimizing run-off; the cheese is even Humane Certified, making them just the third cheesemaker in the US to obtain the designation. Okay, that’s all wonderful you say, but how does it taste? 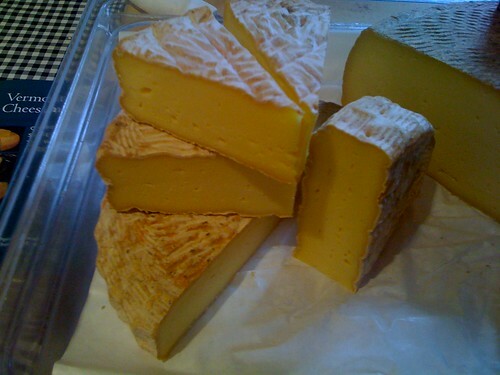 The cheddars are creamy, sharp and flavorful. The smoked cheddar had just enough smoke to lend flavor without overwhelming the sweet creamy cheddar base. The 2-year-cheddar was sharper, but again not overwhelmingly so; just enough bite to balance the creamy, nutty flavors. The cheeses are clearly a favorite of the locals, we spotted this display (above center) at Burlington’s Cheese Traders shop. It was a little early for apple season that far north — the u-pick blueberry patches were still open on our drive up — but if you have a chance to pick up Shelburne’s cheddar, I feel comfortable guaranteeing you’ll enjoy it on a grilled-cheese-and-apple sandwich this fall. It certainly went well with the Harpoon hard cider we sampled at the festival. As you might expect, it’s Vermont Cheese Week here on Cheese + Champagne, and the first virtual postcard from Vermont comes from Blue Ledge Farm in Salisbury, in the southern end of the Champlain Valley. We drove through the valley en route to the Vermont Cheesemakers Festival, and it was breathtakingly beautiful even with the on-and-off rain showers. 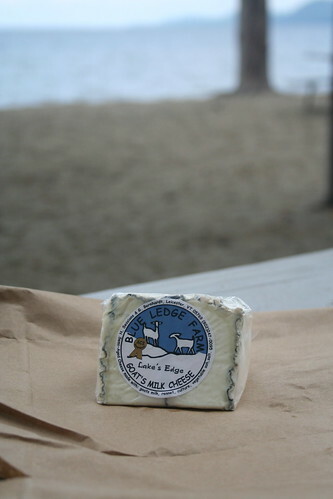 This was one of the last cheeses I sampled at the festival, and I was delighted to find Hannah Sessions of Blue Ledge Farm tucked into the back corner as their Lake’s Edge is on our Wine Spectator list and had proven hard to find further south. 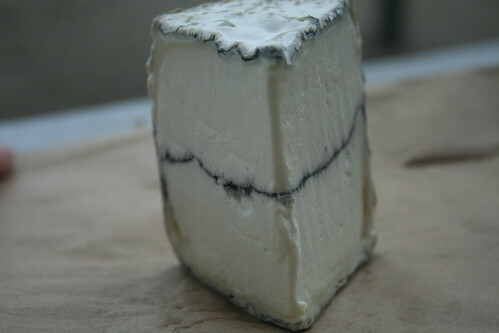 This cheese is similar to Humboldt Fog, in that it is an aged goats-milk cheese with an ash layer and bloomy rind, but its taste is markedly distinct. It is fresher, with that sweet, clean taste of fresh chevre; the jet-black line of ash adds an earthy tang that awakens the palate. The pure milk taste distinguishes Lake’s Edge from more sour goats-milk cheeses, making this cheese approachable without compromising on flavor. 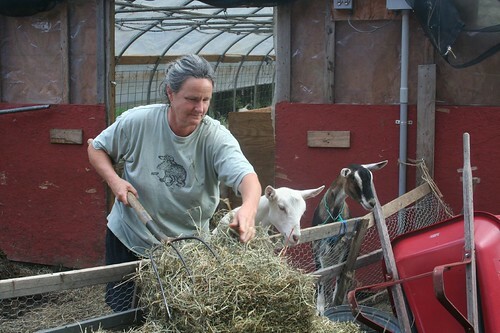 Blue Ledge Farm has a mixed herd of Alpine, Nubian and Lamancha goats, milked in season (February through November) and rotationally grazed on organically-maintained farmland. In keeping with the cheese’s name, we ate this cheese for lunch on the shores of Lake Champlain — by hand, improvising with dried banana chips as knives. My sister-in-law and I literally had to fight my 3-year-old for the last bites.